Aldermen Bob Fioretti (from left), Roderick Sawyer, Nick Sposato and Toni Foukes are among the nine city council members who formed the Progressive Reform Coalition to advance their issues. CITY HALL — Nine would-be maverick aldermen declared themselves the Progressive Reform Coalition Tuesday. 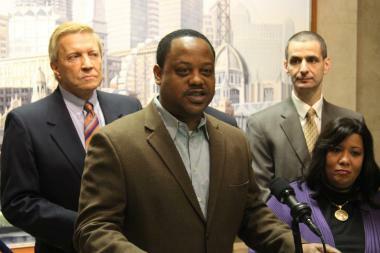 Although there has been a loose amalgamation of self-declared progressives on the City Council for years, Ald. Ricardo Munoz called it "historic" for the nine to form an organization with a set of bylaws, a statement of principles and a political action committee. The nine declared war on "business as usual" in the council and announced their intention to free progressive legislation from the Rules Committee, recently labeled "Where good legislation goes to die." The coalition will be chaired by Aldermen Bob Fioretti (2nd), Roderick Sawyer (6th) and Toni Foulkes (15th), and also will include Aldermen John Arena (45th), Leslie Hairston (5th), Ricardo Munoz (22nd), Ameya Pawar (47th), Nick Sposato (36th) and Scott Waguespack (32nd). "The city's progressive voices need to stand together to push for policies that create a more just and equitable Chicago," Fioretti said, identifying key issues as privatization, government transparency and the closing of schools and mental-health centers. "We were just frustrated with the progress we were seeing in the area particularly of services," Sawyer added. "We just want to have a voice for those that are considered voiceless." "This is not an 'anti' group," Sawyer insisted, vowing to dislodge legislation in the Rules Committee under Ald. Richard Mell (33rd). "We can do better if we work together." Among the progressive pieces of legislation stuck in Mell's committee is Sawyer's call for a process to examine all city privatization deals, as well as Pawar's concept of an independent budget office autonomous from Mayor Rahm Emanuel. At the same time, Fioretti announced the group's intent to work with the mayor, not against him. The coalition did promise "procedural moves" using the council's own rules to free its key legislation for votes by the full council. "This is a groundbreaking alliance in the City Council," a group united not by demographics but by ideals, Munoz said. "What guides us is a set of beliefs and values and a vision for what Chicago can be."